Composites the Foreground over the Background using a Matte while defocusing both layers by different amounts. Defocus Front: Default: 0.1, Range: 0 or greater. The amount to defocus the Foreground and its Matte. This parameter can be adjusted using the Fg Defocus Widget. 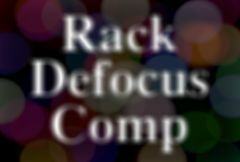 Defocus Back: Default: 0, Range: 0 or greater. The amount to defocus the Background. This parameter can be adjusted using the Bg Defocus Widget. Hilite Threshold: Default: 0.9, Range: 0 or greater.